Oscar is nine months old! He actually turned 9 months old last weekend, so I’m a little late in posting his weight update this month. After his recent health scare, I’ve been taking time to just enjoy him. He has become an important member of our family, and it’s easy to forget to stop and appreciate those we love when life gets busy. The bright spot in Oscar not feeling well is that it reminded me how lucky we are to have this little guy in our lives and how much he has added to our family. The past month brought some behavior issues with Oscar as he’s teething, going through a toddler phase, and also starting to challenge our household hierarchy, but we’ve been slowly working through those challenges. Some of his behavior changes are due to winter and his boredom from being stuck inside due to the cold weather so, while some of the issues are real and need intervention, others should improve when the weather warms up and Oscar can get outside to root around. Despite starting out on the naughty list this year, Oscar loved his first Christmas! He worked hard to get back on the nice list by writing Santa a letter and baking him cookies, so Santa eventually changed his mind and made a stop to bring Oscar presents. The start of the new year gave us a chance to reflect on how much of a difference Oscar made in our lives in 2015. We waited a long time to add a mini pig to our family, and we weren’t really sure how a mini pig would impact our daily lives. Though not every day has been easy, we are still so happy we made the decision to bring Oscar into our family and hope we have many, many years to come with him. At 9 months old, Oscar is 21 pounds, 15″ tall, and 24″ long. They grow so fast in the first year. 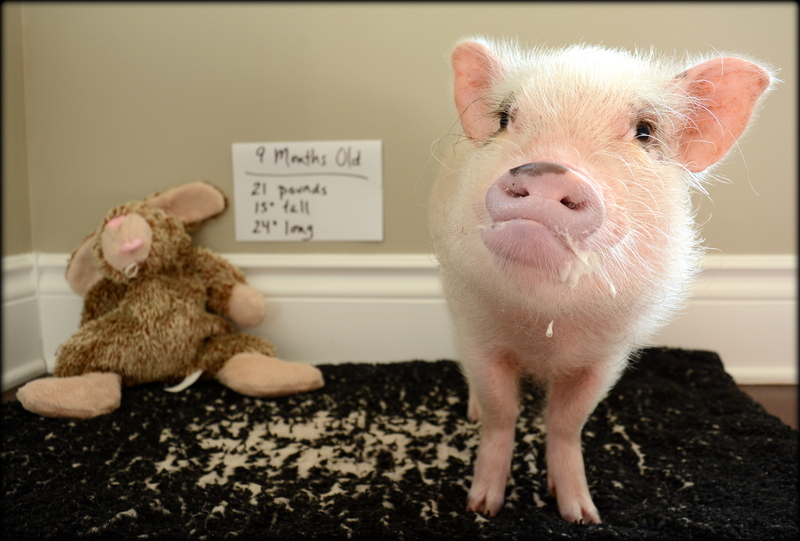 My pig Elmer would grow an inch each month in all the areas I measured…neck/girth/height/length. His growth really slowed down at about a year and a half. He’ll be 2 soon and I noticed his neck and girth have pretty much stayed the same for the past few months but his height and length are still increasing although not by inches. At his highest point he’s almost 20″ and 36″ long. I was told he wouldn’t be more than 9″ tall…haha. They really do grow so fast the first year! I feel like Oscar gets a little bigger every time I blink, and he’s kept a pretty steady weight gain of a few pounds each month for a while. I keep expecting he’ll hit a growth spurt and put more weight on soon, but we’ll see. That’s awesome that you checked Elmer’s measurements in neck/girth/height/length each month. It’s fun to see how much they’re growing and where. I haven’t even thought about checking Oscar’s neck measurements, but we laugh all the time about how big his neck has grown…haha. That’s good that Elmer’s growth has stabilized a bit now that he’s almost two. I know these guys can easily grow up to age three, but I always wondered if the growth slowed and it sounds like Elmer’s has which is helpful to know. I think we’re in a similar boat with you on the height thing…Oscar was supposed to be 12″ tall maximum and he’s at 15″ already, so I get what you mean! It doesn’t bother me at all, but it’s definitely different than what we were told which I think is super common. How big will mini pigs get at full grown? Hi Brice! Unfortunately, that’s a difficult question to answer. 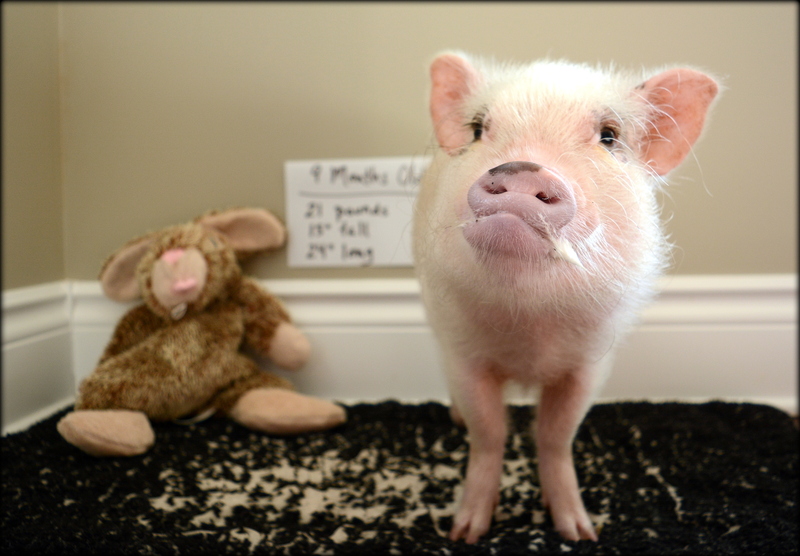 Oscar is relatively small so far for a mini pig, as they can reach up to 150+ pounds. One important thing to know is that mini pigs can grow until they are 5 years old, so keep that in mind if you are looking at a breeder’s site and the parents are under that age. It’s possible the parents aren’t full grown, so their piglet could easily grow larger than the parents when they bred the piglet. The best advice I can give on size is to not get a mini pig unless you’re completely okay with having a 150+ pound pig. To me, it’s a plan for the “worst” but hope for the “best” situation. 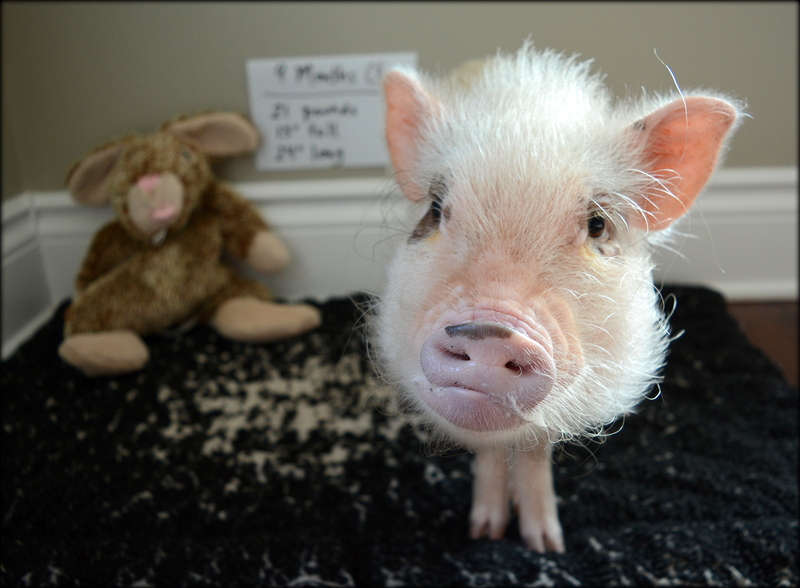 So, if you’re interested in a mini pig, check your zoning laws and make sure you’re completely okay with keeping a pig and have the space for it even if it grows larger than your expectations. I knew we were ready to get Oscar when I was 100% okay with having a 200 pound pig and would still love him and have the space for him if he grew larger than the breeder told me. You don’t want to get a piglet and then bond with it, only to have to give her away because she grew too large. Just some things to consider on mini pig size!